The Clare Boothe Luce Program of the Henry Luce Foundation has awarded a $270,000 grant to the University of Michigan. The funding will support women PhD students through the Michigan Institute for Computational Discovery and Engineering (MICDE). The program aims to encourage women “to enter, study, graduate and teach” in science, and the funding will support women PhD students who make use of computational science in their research. For details on applying, and fellowship requirements, see the fellowship page at micde.umich.edu/academic-programs/cbl/. The fellowships carry a $35,000 annual stipend and tuition, among other benefits. They will be awarded to students applying for PhD programs in fall 2019 in the College of Engineering, or several programs in the College of Literature, Science and the Arts (Applied and Interdisciplinary Mathematics, Applied Physics, Astronomy, Chemistry, Earth & Environmental Sciences, Mathematics, Physics, and Statistics). The CBL program at U-M is funded by the Clare Boothe Luce Program of the Henry Luce Foundation, with additional support from the Rackham School of Graduate Studies, the College of Engineering, the College of Literature, Sciences and the Arts, and MICDE. 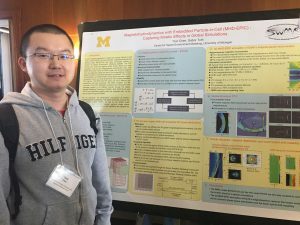 The Michigan Institute for Computational Discovery and Engineering (MICDE) is pleased to announce the 2018-2019 recipients of the MICDE Fellowships for students enrolled in the PhD in Scientific Computing or the Graduate Certificate in Computational Discovery and Engineering. The fellowships, which carry a $4,000 stipend, are meant to augment other sources of funding and are available to students in both programs. See our Fellowship page for more information. Description: Engineers are encountering and generating a ever-growing body of data and recognizing the utility of applying data science (DataSci) approaches to extract knowledge from that data. A common barrier to learning DataSci is the stack of prerequisite courses that cannot fit into the typical engineering student schedule. This class will remove this barrier by, in one semester, covering essential foundational concepts that are not part of many engineering disciplines’ core curricula. These include: good programming practices, data structures, linear algebra, numerical methods, algorithms, probability, and statistics. The class’s focus will be on how these topics relate to data science and to provide context for further self-study. Eligibility: College of Engineering students, pending instructor approval. Instructor: Heather Mayes, Assistant Professor, Chemical Engineering, hbmayes@umich.edu. The course, instructed by Prof. Raj Rao Nadakuditi (EECS), is an in-depth introduction to computational methods for identifying, fitting, extracting and making sense of patterns in large data sets. Over the past year, MICDE’s educational programs and activities have experienced tremendous growth. 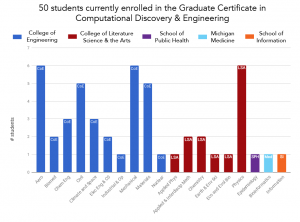 The Graduate Certificate in Computational Discovery and Engineering currently has 50 students enrolled, spanning 19 departments from 5 different schools and colleges. Sixteen students graduated within the last academic year, and 44 have graduated since the Graduate Certificate was established in 2013. Even further, the number of women in the program went from zero in 2014 to 15 currently enrolled. 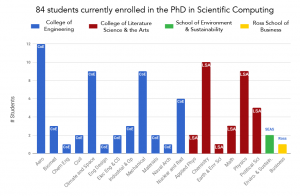 The Ph.D. in Scientific Computing has experienced extraordinary growth, with 74 students enrolled from 20 departments, and four schools or colleges. We added a section to our web site with both programs’ alumni information. We are working to broaden as well as to deepen the activities and resources available to students in both programs. Twenty MICDE fellowships were awarded this academic year to students in our programs. We continued to sponsor student software teams at competitions, as well as individual students presenting their work at leading conferences. On-campus, MICDE student activities include networking lunches, and the Scientific Computing Student Club (SC2). On the programmatic front, our non-engineering students now have access to a CAEN account that gives them more options to connect and use U-M High Performance Computing resources. Relevant grant opportunities for students are tracked and updated in MICDE’s grant webpage. Several educational projects and initiatives are afoot at MICDE, including a Massively Open Online Class (MOOC) in Computational Thinking targeting both high school students and their teachers. This MOOC aims to introduce learners to algorithmic approaches to problems. This initiative is being developed in collaboration with the School of Education, the office of Academic Innovation, and with input from a number of high schools in the Detroit Metropolitan Area.The two new courses launched by MICDE faculty last year, Methods and Practices of Scientific Computing, and Data-Driven Analysis and Modeling of Complex Systems, were successful in their first offerings during the 2016-2017 academic year, and are being offered again in 2017-2018. Other teams of MICDE faculty are at work across campus to develop new courses in computational science.